The battle for the mobile wallet is starting to heat up as the number of smartphone owners is skyrocketing. The mobile payments market is poised to see thousands of consumers willing to hand over there wallets to big tech companies. Companies like Square and Google have already created a medium for mobile payments that are being used my numerous consumers and vendors. Although these companies may have seized a sizable market share, the mobile payments landscape has much more room to grow. Upcoming businesses like Clinkle, a start-up created by drop outs at Stanford university, recognize the need for mobile wallets and are rushing to to capitalize on the growing market. 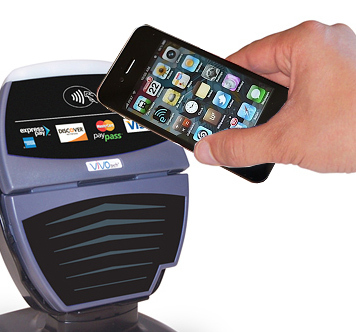 Verifone is one of the current mobile payments providers on the market. As with many other big technological innovations there is usually one product or program that eventually rules the marketplace. In the case of social media, the majority of consumers use Facebook in respect to other programs that offer the same services. The same could be said of Google and the search engine market. After a period of growth and innovation most tech advancements are monopolized and are solely controlled by one business. The market for mobile payments is still in the preliminary stages of growth but soon a single company will improve upon the early efforts mobile wallets pioneers and become the king of smartphone payments. Clinkle is an example of a company trying to become the one stop shop of all mobile wallets. Will they succeed? Only time will tell. Probably one of the biggest hurdles that mobile payment providers have to overcome is the unwillingness to change consumers routine in paying with wallets. The ease of paying for products with debit cards and cash is already quite simple, fast, and effective. What incentive do consumers have in handing their finances over to a third party mobile payment provider? Well, one advantage mobile payment company will provide is the ability to transfer funds between different users. Splitting checks and handling money between your friends and families will become much simpler then withdrawing cash from ATMs or writing checks. Transfers can be done much faster between two private parties then ever before. But with all this financial data being exchanged, does the mobile wallet come with a price tag on your privacy? The real money that could be made from mobile wallets is the mass amount of data being collected on the purchasing habits of consumers. Imagine being able to tap into the type of products a customer pays for and linking that information with other data collected on their phones. Companies like Coca-Cola could in theory discover that the majority of coke buyers using a Tallahassee area code are college students who use mostly Instagram for their chosen social media. This information could give Coca-Cola an advantage on how to segment and market to their biggest consumer base in the 850 area code. The big drawback is the invasion of privacy that plague many other social media websites. Users may not adopt the new mobile wallet service for fear of intrusion into their text messages, phone conversations, and emails. Other users may fear hackers attempting to steal the money in their mobile bank account. Consumers value their security and privacy so much so that they might forsake these new mobile payment services and just stick with the ancient and archaic way of purchasing goods: the debit check card.